Title: Legal Office Transcription, 3rd Edition, 2011. Author: Tina Kamakaris, Professor Emeritus, Seneca College, Toronto. Classification: Audio files for legal assistants, law clerks, and paralegals. Available: Instructor support, including test bank. The Legal Office Transcription by the renowned author, Tina Kamakaris, is completely updated. The Legal Office Transcription is suitable for use in any province in Canada either in conjunction with the Legal Office Procedures textbook by Tina Kamakaris or independently. 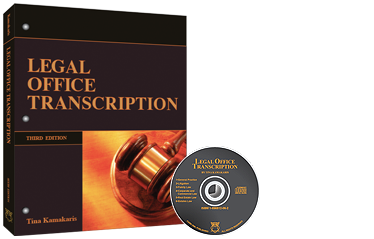 The Legal Office Transcription consists of an easy-to-use Student Guide and a CD of audio files. The student transcribes interesting legal files that unfold gradually, enticing the student to want to learn more about what happens next in the files. The files are pedagogically designed to develop the student’s language skills, legal vocabulary, and transcription skills while simultaneously capturing the legal office in operation. The transcription covers the areas of General Practice, Litigation, Family Law, Corporate and Commercial Law, Real Estate, and Estates. Each of these areas of law begins with preparatory exercises in legal terminology and grammar brush-up. New design and easy-to-use softcover format.